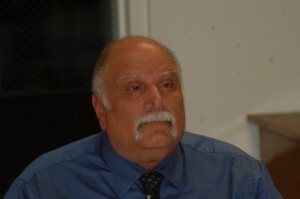 Two years after agreeing to stay on after the Hartford Board of Education initially accepted his resignation, Superintendent Thomas Abraham has made it official and will leave the district in June 2013. The board, which accepted Abraham’s resignation Monday night, already has a replacement chosen and will announce the name of the new superintendent at its October meeting. In 2010, Abraham agreed to stay on through June 2013, because the two in-house candidates were unable to take the position. Andrew Cook, principal of the high school, and Bethellen Mannix, the elementary principal, showed interest in the position. Hartford has a residency requirement for its superintendent, and neither Cook nor Mannix live in the district. Janine Thomas, the board vice president said the candidate the board selected will move to the district. Resident Candice Combs asked why the board did not seek outside applicants. “We were happy with the internal candidate, and we didn’t look anywhere else,” Thomas said. She added that the board felt it did not need to seek outside candidates. Abraham is starting his 21st year as the school’s superintendent, making him one of the longest-tenured school leaders in the region. Brian Getty, president of the district’s Board of Education, said Hartford was fortunate to have Abraham and especially fortunate to have him staying another year. Cook, who has been in the district for six years, said Abraham has made a difference in his professional career. Petty, who has children in the district’s schools, had high praise for Abraham. “He’s always been very approachable and very professional,” Petty said. “Whether he agrees with you or not, you can walk through the door and know he’s still going to be there for you. You could always trust him. I think that was always been the case with the staff, too. He’s always been very open and honest with the board. Cook added that Abraham is always focused on the students’ needs. Petty said some have wondered why Abraham has stayed in the position for two decades. Supervisor Dana Haff said he has been able to work effectively with Abraham.